The National Assembly has started discussing a Bill for Amendment and Supplement of the Animal Protection Act submitted by the Council of Ministers and related to the stray dog population control. Taking into account the good practices in the pet population management and the remarkable progress in solving the pet overpopulation issue in many areas of the world, we would like to bring your attention to our proposal for additional amendments and supplements to the Animal Protection Act and our respective arguments. We look forward to cooperating with you since our joint efforts could contribute to the introducing modern legislation in the field of animal control. "(7) When bringing a pet dog into public places, the dog shall wear a collar with a built-in plate or an address tag or medallion firmly attached to it specifying the dog owner’s names, address and telephone number." "Chapter Five. Roaming and unowned dogs". "Art. 40c. (1) Each municipality, independently from or together with one or more neighbouring municipalities, shall appoint at least one dog control inspector. 15. keep the records of captures for a five-year period." The words "Art. 40, Par. 2 and 4" are to be replaced with the words "Art. 40c". In Par. 4 the words "are managed and controlled by a veterinarian" are to be replaced with "shall include a veterinarian". "1. ensure that roaming dogs are taken in under the agreement with the municipality as per Art. 43, Par. 1, section 1;"
"5. open an individual record for each animal taken in, where he/she shall enter detailed data of that animal and the circumstances regarding its entry and exit." 1. the number of pet animals, by species and breed, on hand as of January 1 of the reported year. 2. the number of pet animals, by species and breed, on hand as of 11:59 p.m. on December 31 of the reported year. 3. the number of pet animals, by species and breed, entering the shelter during the reported year (including animals redeemed and adopted but returned by their owners during the reported year). 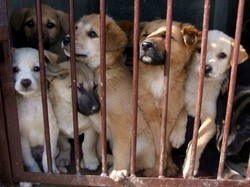 4. the number of pet animals, by species and breed, redeemed by their owners and not returned during the reported year. 5. the number of pet animals, by species and breed, adopted and not returned during the reported year. 6. the number of pet animals, by species and breed, transferred to other organizations which shall be specified. 7. the number of pet animals, by species and breed, neutered and released. 8. the number of pet animals, by species and breed, killed during the reported year. 9. the number of pet animals, by species and breed, which have run away or died naturally or were subject to such other disposition which shall be specified. 10. the method of killing and the manner of disposition of the remains. 11. the amounts of public funds and the amounts of private funds and the sources thereof which are expended in support of the activities which are the subject of the report." "(4) In case of an animal brought in by a dog control inspector, the manager shall register the animal’s record with the number already assigned by the inspector and the original data from the file opened by the inspector shall be used as appropriate." "(5) In case of an animal taken in apart from the cases specified in Art. 2, the manager shall register the animal’s record with a unique number provided by the municipality." "(6) The shelter manager shall ensure access of the dog control inspectors serving the relevant area to the internal record-keeping system." "(7) The shelter manager shall keep the individual files for a period of at least 5 years." "Art. 44а. The mayors of the municipalities shall provide and distribute unique file numbers for the dogs specified in Art.40c, Par. 2, section 5 and Art. 44, Par. 5 to the dog control inspectors and shelter managers, avoiding any repeating number within the area served." “Art.44b. (1) The Minister of Agriculture and Food shall approve a standard form for the shelter managers’ annual reports specified in Art. 44, Par. 3 that includes a declaration by the person who has completed the report verifying its truthfulness and accuracy. Paragraph 4 is to be rescinded. The word "municipalities" is to be replaced with the words "dog control inspectors". The proposal is based on good practices in the United Kingdom, the Republic of Ireland, Canada and the United States, where the success in the field of companion animal management in recent decades is undisputable. It includes substantial measures for establishing an effective and transparent management of both owned and unowned dog populations. The current legislation related to animal protection and the Council of Ministers’ bill indicate the neglect of three key issues in the dog control. First of all, no single body is specified as in charge of the daily restriction of poorly kept owned dogs that are a major cause for stray population recovery. Secondly, no job position is specified as involved in the routine checking and controlling a local stray dog population outdoors. And thirdly, the very opportunities for arbitrary and intransparent disposition of animals entering the shelter system remain unaddressed. These striking omissions would continue to hinder dealing with the true problems in animal control. Sticking to such incomplete and inefficient legislation would continue to harm taxpayers, public health, national companion animal population’s welfare and last but not least, Bulgaria’s international image. 1. The amendment to Art. 35 (1th point in the proposal) aims at achieving easy identification among roaming owned dogs (as different from their registration), which is a precondition for the efficient control of movement and hence the spontaneous reproduction among this problematic subpopulation. As they do have abode and other resources, roaming owned dogs can breed most successfully in comparison to the rest of the roaming dogs and therefore they should be considered as the major source of unwanted population. 2. The amended title of Chapter Five (2nd point in the proposal) aims at addressing one of the most problematic categories of animals in Bulgaria, i.e. roaming owned dogs. 3. The introduction of the new Art. 40c and the amendments to Art. 42 and 49 (3th, 4th, 5th and 10th points in the proposal respectively) aim at providing measures for an efficient and transparent field work with roaming populations (both owned and unowned). The requirement for appointing dog control inspectors has been borrowed from countries where dealing with pet overpopulation performed in recent decades is generally recognized as successful and the role of this position has turned out to be a crucial one. Inspectors are known as “dog wardens/animal wardens” in the UK and the Republic of Ireland, “dog control officers/DCOs” in the USA, or “animal control officers” in Canada. This proposal expects new services to replace currently existing dog catcher teams that serve animal shelters as they have extended and specific responsibilities. Their functions should include promoting responsible pet ownership, saving lost pets and monitoring stray population dynamics and statuses of the individuals within roaming populations. Street dog control in Bulgarian municipalities now falls entirely within the range of animal shelter managers responsibilities and many bodies operating animal control facilities presumably would prefer to have a large number of strays to catch and collect. There are substantial figures that are hardly known to anyone outside the shelter system - how many stray dogs there are in a larger municipality, how many newcomers appear every year and what happens to all of them afterwards. For example, the only statistical data for Sofia is announced by the media and this shows extreme discrepancies between numbers. The Ecoravnovesie Municipal Company, which runs two shelters and simultaneously manages roaming dog population, has reported a total of approximately 40,000 unowned dogs having been neutered and released in public places since 2006. However, the last count of 2013 showed that there were only about 6,000 strays. Meanwhile, more than BGN 15 million of public finances has been spent so far on funding this corrupt system. This terrible mess makes situation analysis and assessing dog population dynamics impossible and prejudices public interest. The new services will not present an additional burden to taxpayers because shelters’ budgets are to be reduced due to closing down dog catchers positions. 4. The amendment to Art. 44 and the insertion of the new Art. 44b (6th and 8th points in the proposal respectively) aim at making the activities performed by the national shelter system transparent and comprehensible for institutions, taxpayers and animal welfare advocacy NGOs. The proposed amendments determine straight rules of animal shelter managers’ accountability, which is a common practice in leading countries worldwide. The presence of accurate record keeping on animals impounded and discharged will allow regular reassessment of the measures performed and implementation of efficient and fact-based policies in this field. The current act contains some provisions in Art. 40, Par. 2 that require few and rather unclear obligations in this regard. Gaps in legislation allow a shelter manager to arbitrarily distribute animals taken in and to be the ultimate person to establish one's own standards in reporting this major activity (please see point 3). 5. The new Art. 44а (7th point in the proposal) aims at establishing conditions for exercising an efficient control over roaming animals and their movement, which are currently unavailable. An enhanced traceability of individuals in the streets and shelters would significantly contribute to both transparency and adherence to humane practices in managing roaming population. 6. The amendment to Art. 47 (9th point in the proposal) aims at removing a provision that entirely harms public interest. The now existing Par. 4 stipulates establishing and operating a specific type of shelters located outside places. There are no legal provisions to ensure public access to these facilities. This could be an overwhelming obstacle for owners looking for their lost pets, for instance. Such vicious practice also makes way for intransparent, unaccountable and abusive practices in animal control. In addition, this provision actually prohibits the use of already existing facilities located in industrial areas, for example, which, in turn, results in excessive increase in the costs for construction and maintaining such shelters in remote locations.